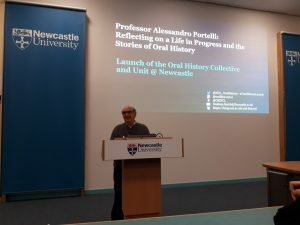 Professor Portelli at the launch of the Oral History Unit and Collective at Newcastle, 10 January 2018. To relisten to Alessandro Portelli’s recent lecture, please click here. This entry was posted in Uncategorised by Graham. Bookmark the permalink. Would it be possible to repost the link or change the permissions on it? It would be wonderful if you could, thank you! I’ve listened to the first fifteen minutes. Wonderful stuff but it’s very frustrating that the recording halts every sixty seconds or so and I have to fiddle to get it restarted. Is it possible to fix this or make the recording available as a podcast? It’s working fine for me using Google Chrome – have you tried a different browser?